I meant to add that this pencil sharpens very nicely because of the cedar wood used. Last in the series of Daycraft notebook/sketchbook reviews, I come to the Signature Notebook. This is an A5-sized, 176-page, soft cover notebook finished in Daycraft's signature (pun not intended) Italian PU, this time in a plain, textured, rosy pink hue. 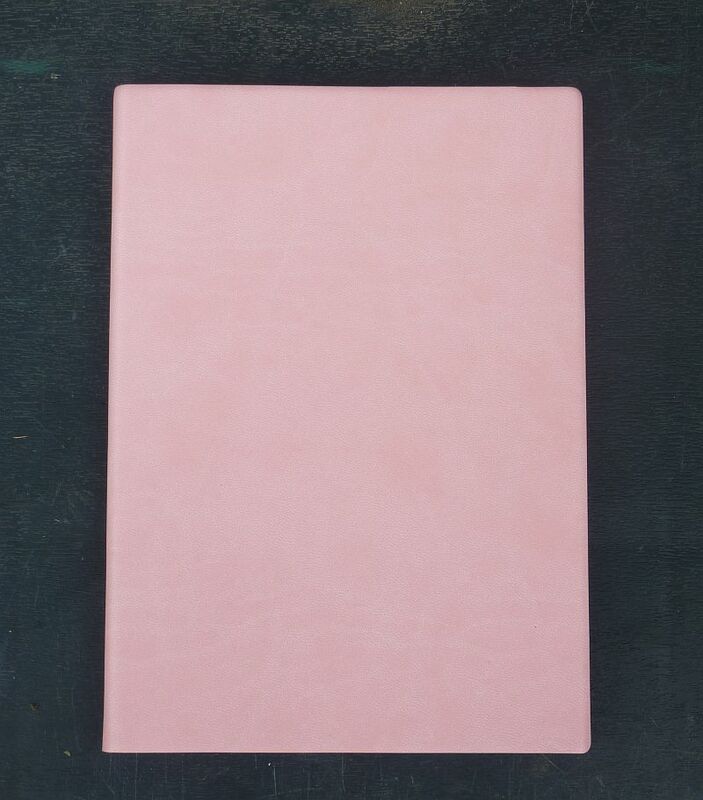 The texture is that of a fine-grain leather, and there is a Daycraft logo embossed discreetly on the back cover. This notebook also has black-paper inside liners. 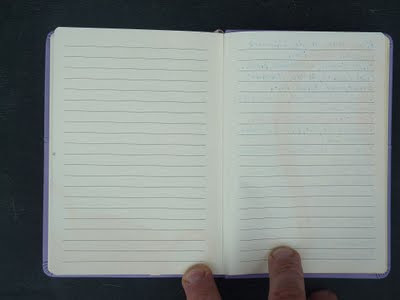 The pages are the customary 100gsm notebook paper, ruled with 6.5mm lines, which is handy for people with small handwriting. 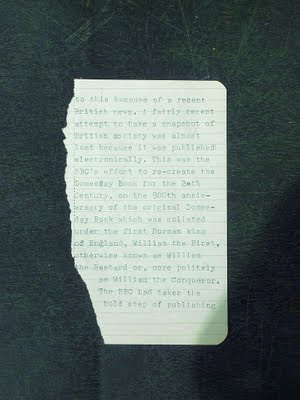 The paper is cream-coloured and edged with black. I tried to take a photo of this but my photography is rubbish, so the resulting picture was blurred. Notebook Loves Pen did a much better job of it, and I suggest you look there if you need an illustration. 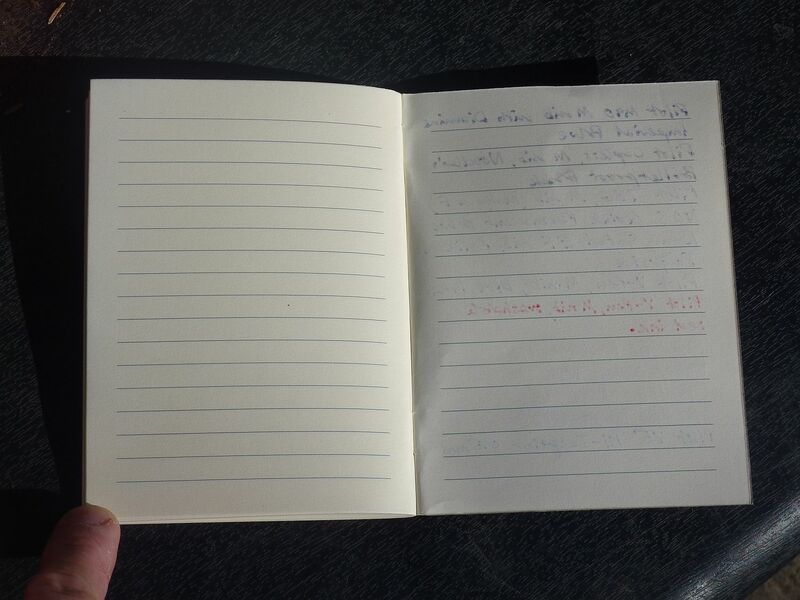 This notebook has a black ribbon page-marker, but surprisingly, no elastic closure or rear pocket. 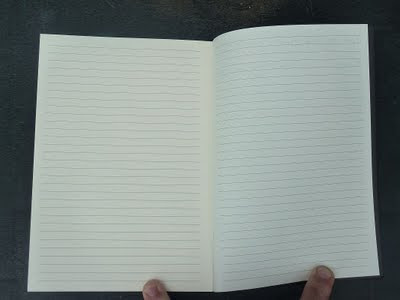 I don't miss these features, but many people might; personally, I find it refreshing that this notebook does not try to copy the Moleskine design. Daycraft have kept this design simple and elegant and should be praised. 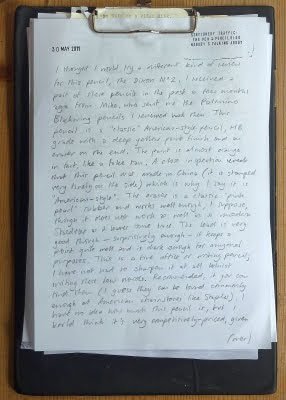 Like the Skinz and Animal Pals notebooks I reviewed earlier, it can be made to lie flat if required, though it will not lie flat on its own. 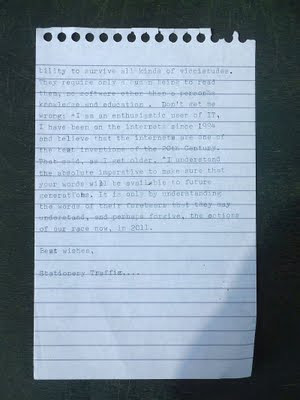 Unlike NLP, I found that, in my tests on the back page using a battery of fountain pens, rollerballs and pencils, the paper held up pretty well. 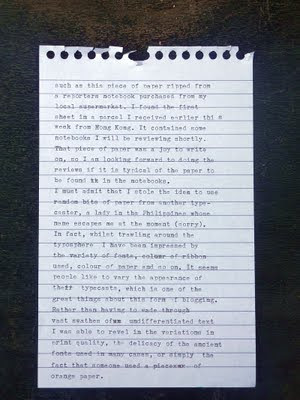 There is no discernible feathering from the ink that I can see with the naked eye, and only slight bleedthrough with my wetter nibs, the M90 and the Capless. 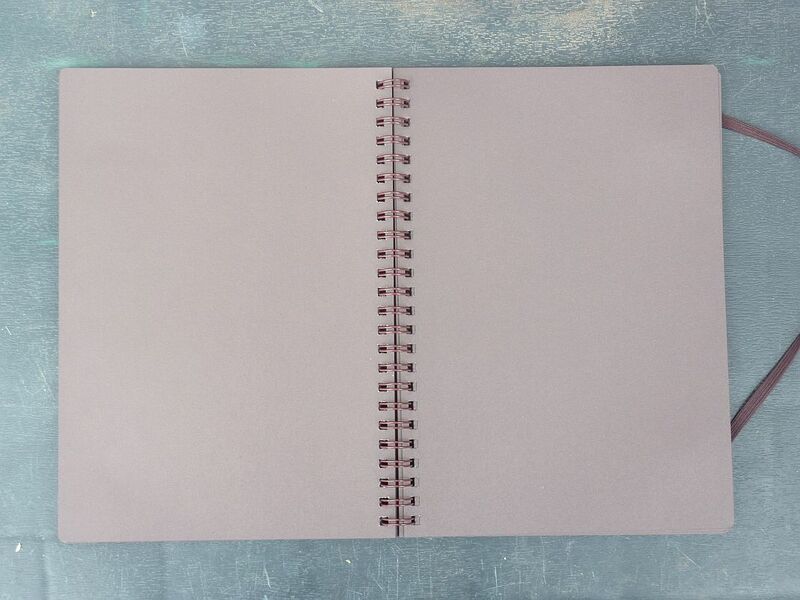 Of all the Daycraft notebooks I have reviewed in this series, this is my favourite, because of its simple design. 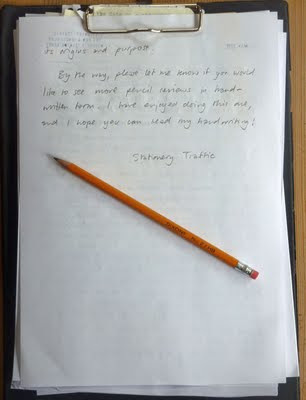 It is unfussy and begging to be used, if only for shopping lists or for writing down notes at a boring work meeting. The cover should hold up well inside a handbag or briefcase if used with care. Recommended. It is available, as with all the Daycraft range, at stationers' in Asia and Australia, one or two places in central Europe, and also online. My thanks once again to Daycraft for the sample. 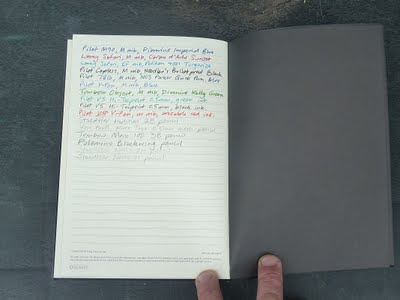 Fourth in this series of reviews of Daycraft products, this is the Decoder Sketchbook. 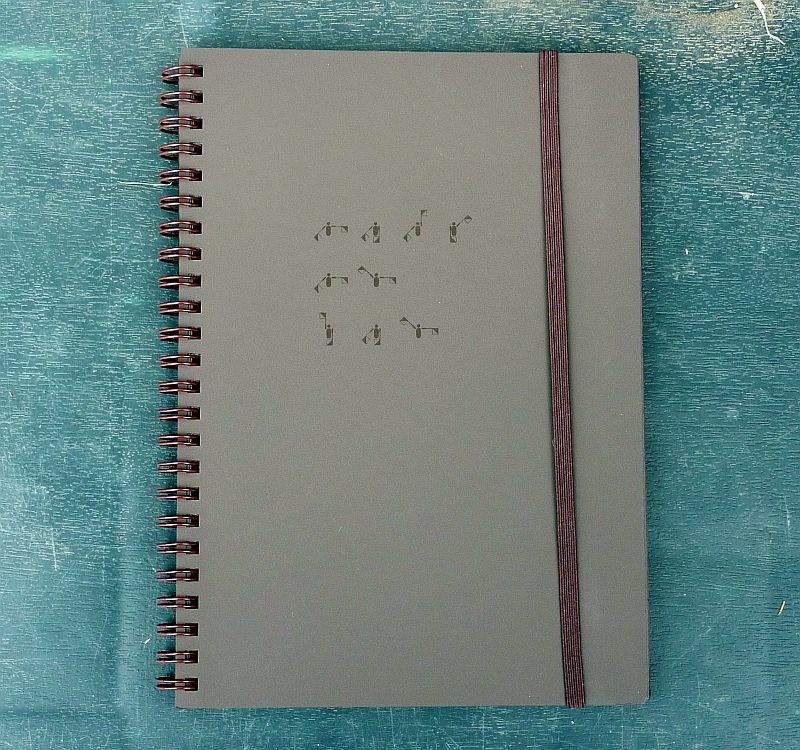 This one, the Semaphore, is one of a range of four A5-size wire-bound sketchbooks, the others being Braille, Morse Code and Sign Language. This comes with a handsome board cover in dark chocolate brown which has UV-spot printed semaphore symbols on the front in glossy paint, and an elastic band closure. Being wire-bound it will lie flat for drawing and it has 100 pages of 120gsm art paper. I have not been able to test the paper, because as you can see in the picture below, it is made in the same dark brown as the covers, so it is clearly meant for people who sketch white-on-dark with coloured pencils or chalk, which I do not do. 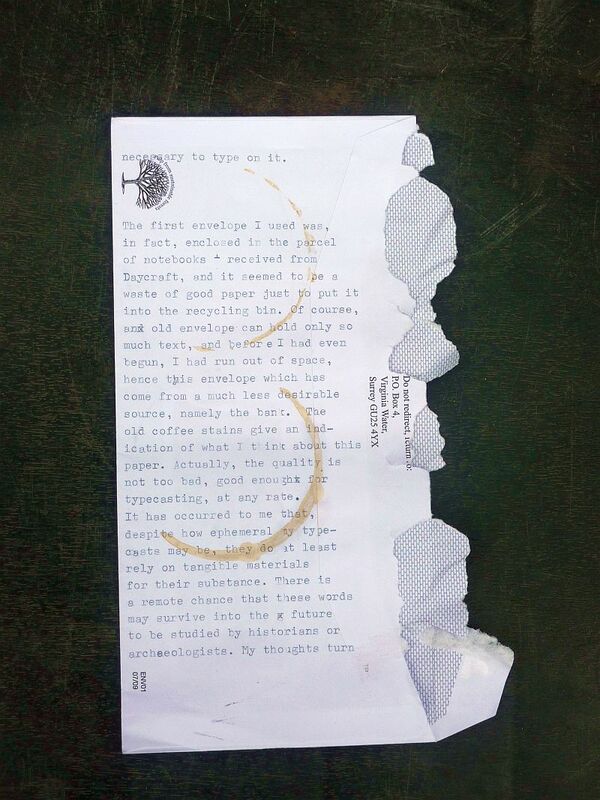 The paper has a matte finish, with enough tooth in it for pencil drawing. 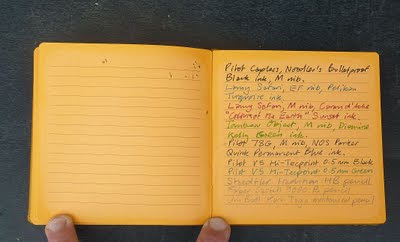 I can imagine someone rendering lunar craters or maria, or perhaps a cathedral spire, using this sketchbook. 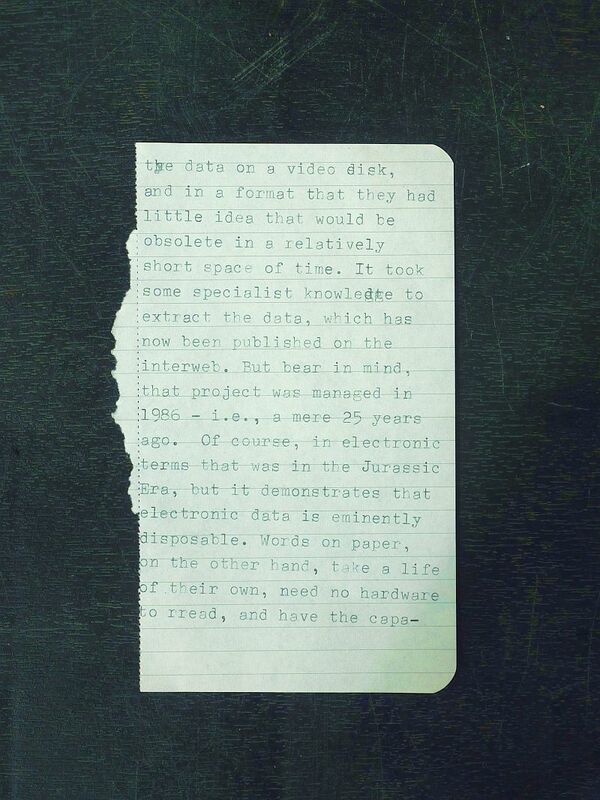 Despite my inability to use it, I can still see that this is another high-quality book. I had problems photographing it properly, as these photos do not do it justice. In reality, this is a darker brown than illustrated - think Bournville or Hershey's chocolate for an approximation of the colour. 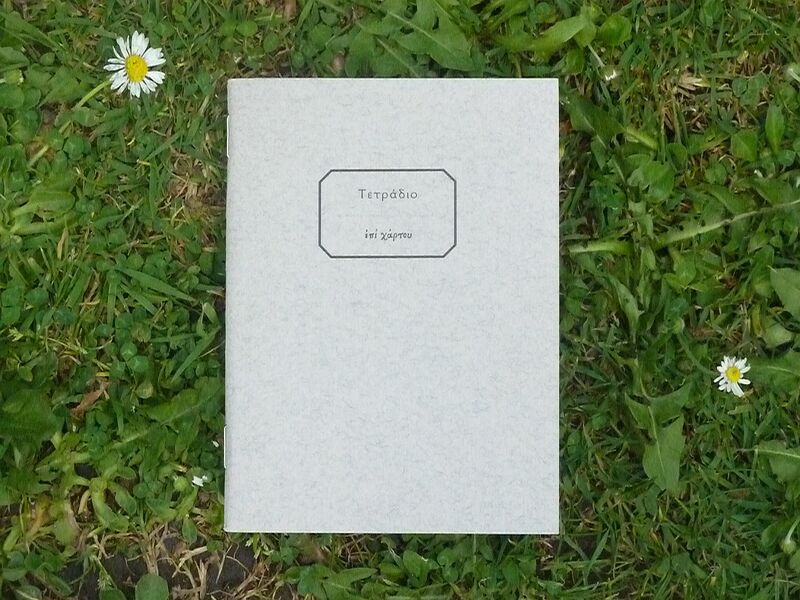 There is a key to the different symbols on the back cover, and a blurb on the inside, on the first sheet, describing what semaphore is and how it could be used: according to this, it is still acceptable internationally to use semaphore for telecommunication. 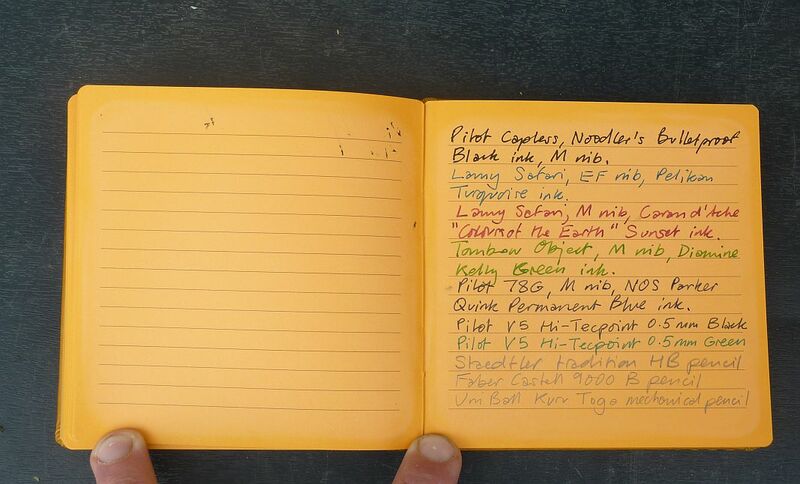 This is a fine, if unorthodox, sketchbook. 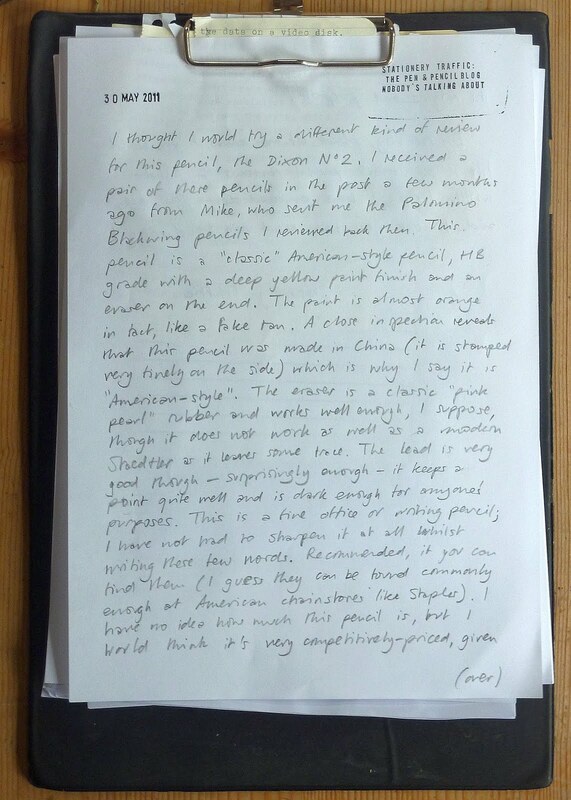 Thanks to Daycraft for the review sample. 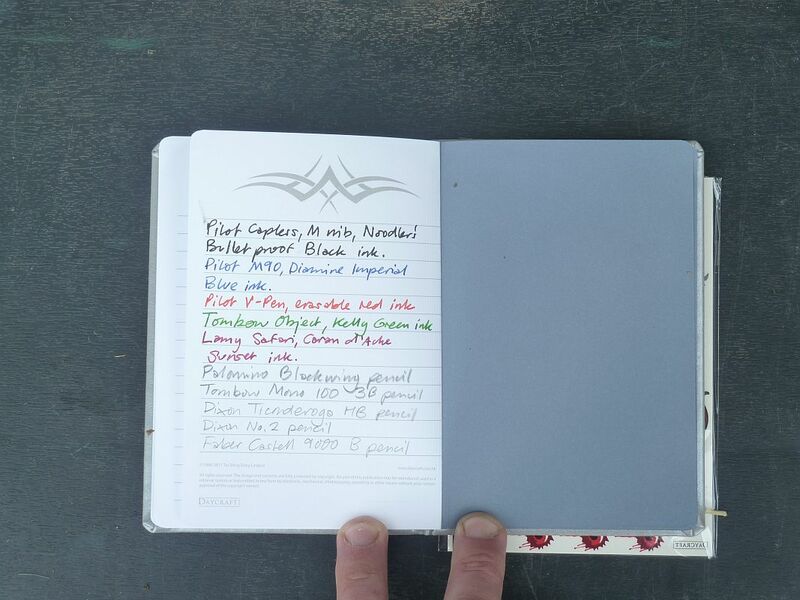 This isn't just any old cheese cracker, this is the Daycraft Cookie Bookie Notebook. 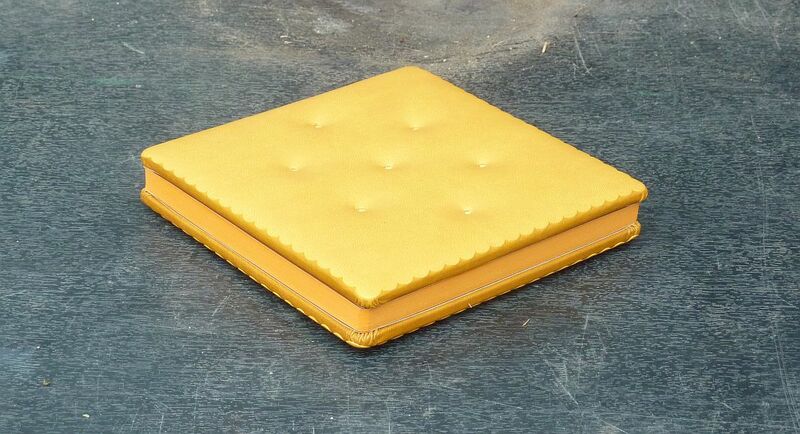 In common with the previous Daycraft products, the covers are made from "Fine Italian PU", in this case with the fine pigskin-texture of the Animal Pals notebook but with added upholstery-stitching to suggest the shape and texture of a baked biscuit. Underneath, the board used is rigid, just like a biscuit, in fact. The edging is darker than the rest of the paper, which I suppose is the result of the manufacturing process. This notebook is great fun, and forms part of a small range which includes an Oreo clone and a lemon waffle (or wafer, as we would call it here). 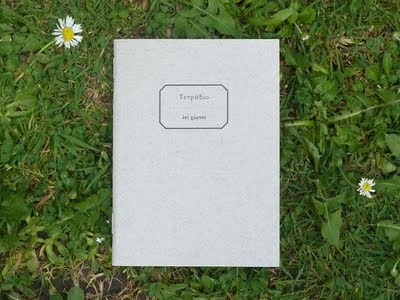 There are 144 pages to play with, which should be enough for anyone. Thanks again to Daycraft for the samples. 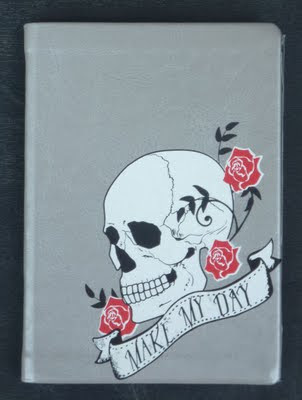 Second in the series of Daycraft notebook reviews, this is the Skinz notebook, finished in silver with a curious "tattoo"-style design on the front cover. I have just checked the Daycraft website and can find no reference to this line, so I guess it is new for 2012. There are two notebooks in this line, the other sporting a beige cover with crossed Colt .45 revolvers. 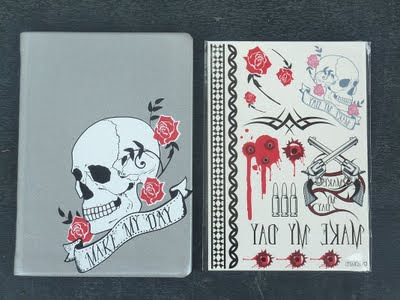 The paper is white, ruled with 6.5mm lines, and decorated with a "tattoo" design at the top of each page which would not be out of place on a motorbike or the small of a rock-chick's back. 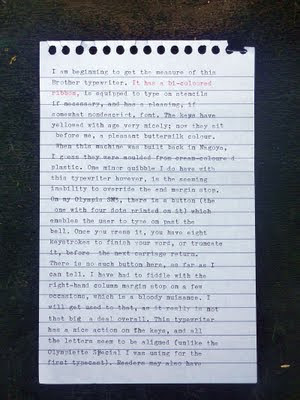 This paper is excellent - there are 128 pages of 100gsm stock which takes fountain pen ink very well. 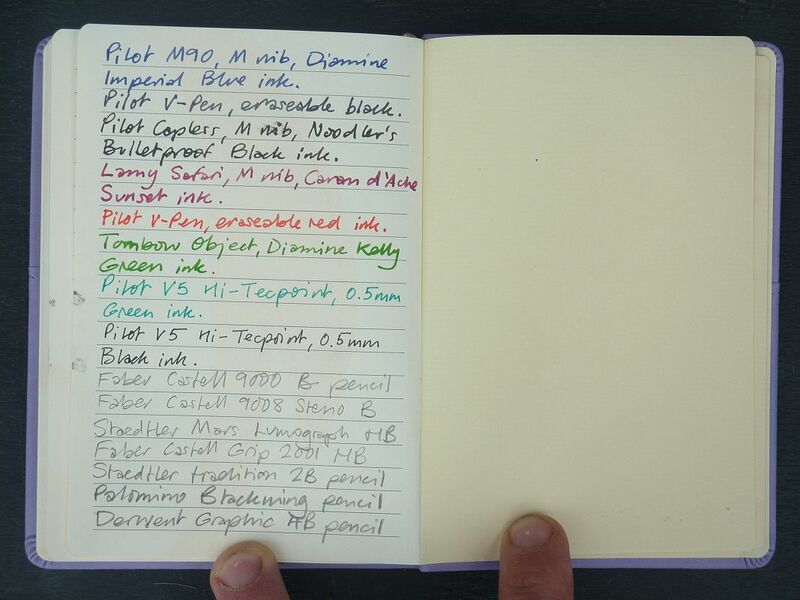 There is barely any bleedthrough at all with my fountain pens at any rate, and no feathering detectable in any of the ink samples I tested it with. (Sorry, I forgot to take a pic of the reverse, but believe me, there's barely a trace.) 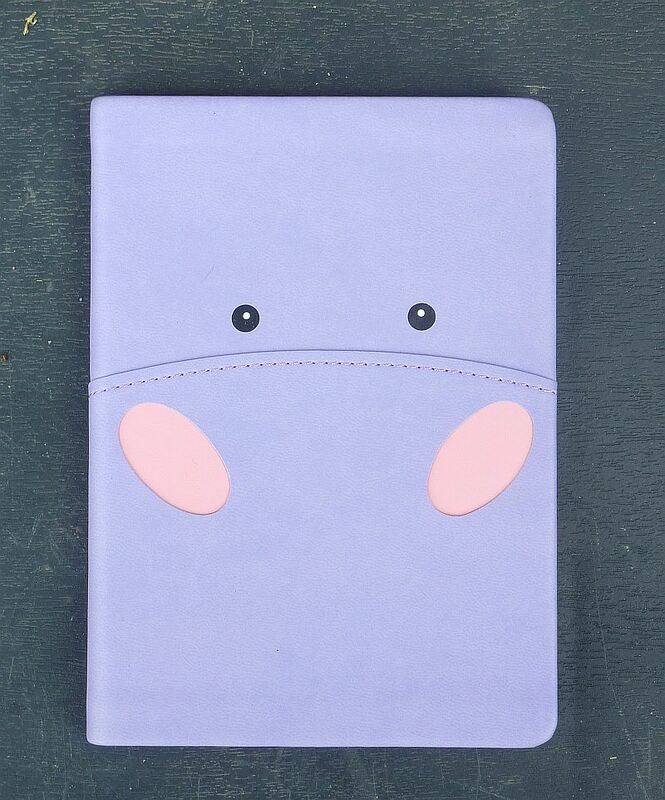 The covers are board-like, much stiffer than the Animal Pals notebook and more like a Moleskine. This notebook is case-bound, and the pages can be made to lie flat for writing on. The styling is not to my taste, but then again I don't think I am in the target audience for this one - I'm guessing it's really for teenagers, and there's nothing wrong with that, especially to introduce young people to fine stationery. My teenage daughter was impressed with this notebook, at any rate. This is another fine product and I can recommend it. As with all the Daycraft range it is likely to be available widely around Asia and Australia. Thanks to Daycraft for the sample. 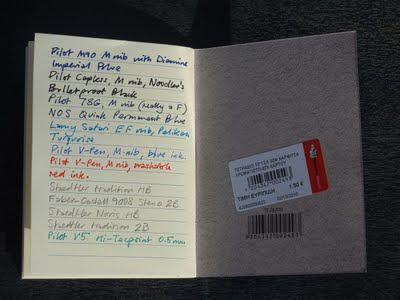 Recently I received a small consignment of notebooks (and one sketchbook) from Daycraft, a Hong Kong-based manufacturer. I shall review them over the next couple of days, and I thought I would review this, the Animal Pals notebook, first. It's an A6-sized pocket notebook with soft covers, and designed with this cute abstract animal design stitched into the lilac-coloured "Italian PU" (sic) cover. Have you guessed what it is yet? Actually this one is a hippo, and is one of a range of five designs, each with a different animal from every continent. The others on the website are penguin and baboon; sheep and panda versions should be available in 2012, if I read the catalogue correctly. 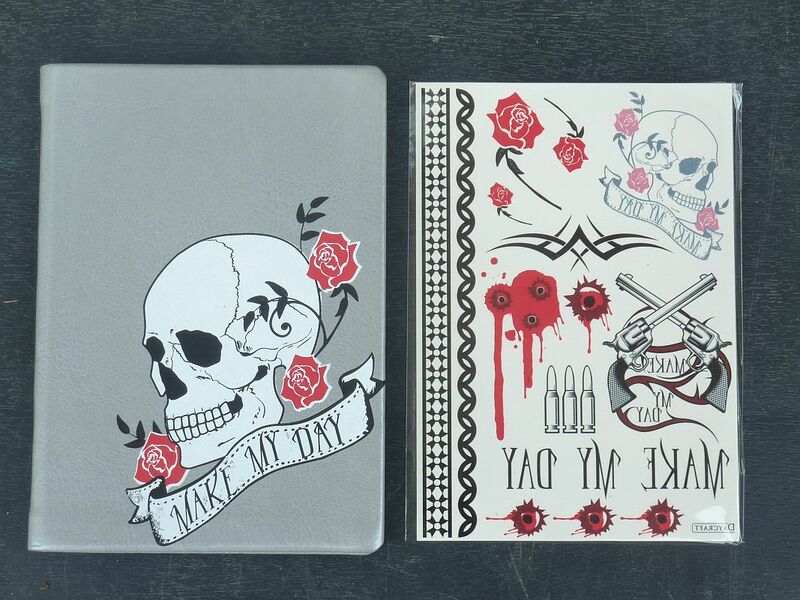 First impressions are that this is a very nicely-made notebook indeed. 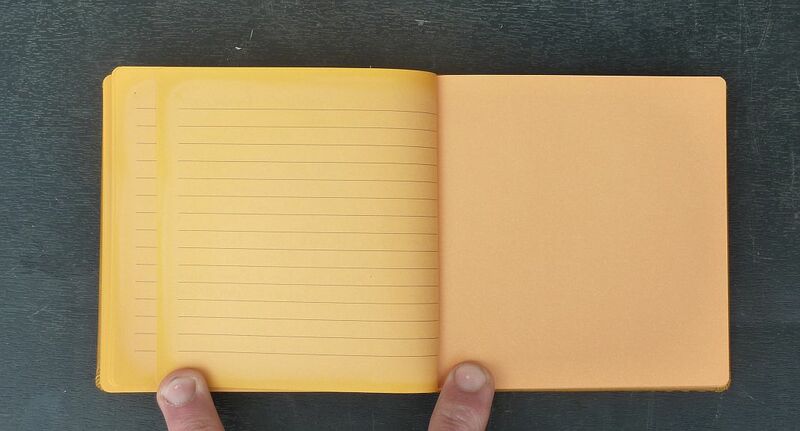 The cover is soft and flexible, unlike the small Moleskine hard black notebook. At A6 size, it is also slightly larger than the Mole (106mm x 150mm, compared with the Moleskine's 90mm x 140mm). I wonder how hard wearing this cover actually is, though, inside a briefcase or handbag, because from experience, I have found the Moleskine to be pretty tough. I'm also slightly surprised that Daycraft have chosen Italian-made material to cover their notebooks, but they make a feature of "imported" materials for their range. It feels very similar to a soft leather, and only the plastic smell betrays its hydrocarbon roots. There's the regulation pocket inside the back cover for ticket stubs, stamps and receipts, and a baby-pink page-marker ribbon, too. The paper, which is probably 100gsm stock, is printed with 6.5mm ruled lines. There's also a subtle animal print on some of the pages - you may be able to spot a monkey's tail curling across one of the pages below. 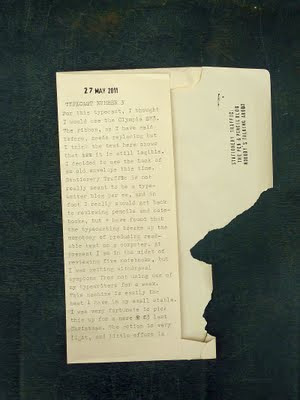 The animal prints are very subtle, as I did not notice them at all until I began to write this review; they are more apparent on the photographs. With the fountain pens, drying time is normal, though as usual, the Noodler's Bulletproof Black took the longest to dry, hence the smudges on the page. 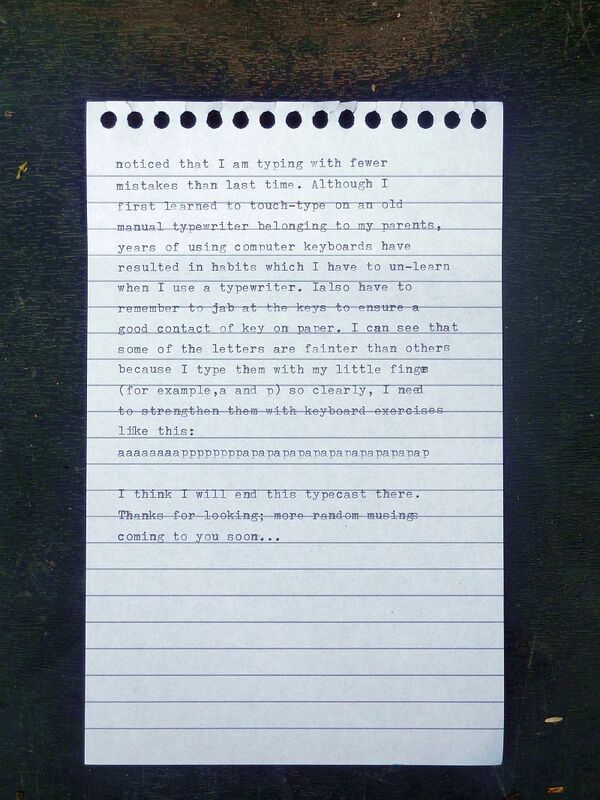 The creamy paper is very pleasant to write on and the 6.5mm gap is a sensible size for most handwriting. 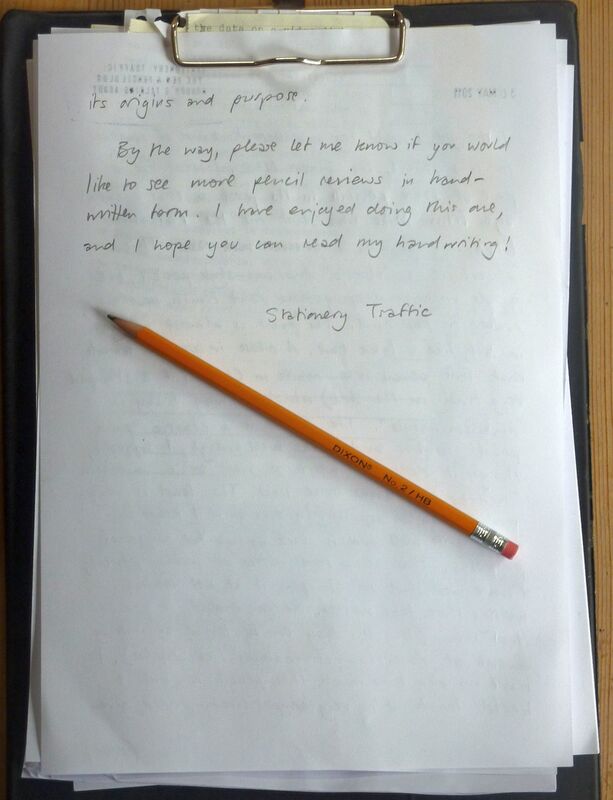 It is case-bound, so whilst it does not lie flat on the desk, you can flatten it out to write in. Overall, this is a fun, very well made notebook, which I think would appeal to children or adults who are young-at-heart. It appears to be available widely around Asia and Australia, and Poland, but nowhere else yet in Europe as far as I know. My thanks to Mr Foreal Lee at Daycraft for the samples. It is the Epi Hartou notebook, purchased recently from the Evripidis stationers by the author of the excellent Palimpsest blog, Lito Apostolakou, and sent to me for a recent comment. Many thanks! There's a bit of bleedthrough from some of my pens, particularly the M90 and the Capless, but nothing to get upset about. There's barely any bleedthrough showing from the finer nibs, as you can see from the other side of the paper. I am really pleased with this delightful little notebook, which I hope to use in the near future for various lists and notes. My thanks again to Lito for this prize. Readers (May I use the plural? Oh, alright then) might notice that the page view counter and the "defunct" blogroll are no more. 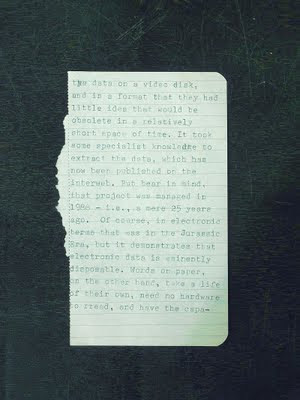 I've been thinking of simplifying the layout of this blog for a little while, and neither seemed fit for purpose. After all, who wants to see a list of dead links and moribund blogs, or an odometer count? * So I've binned both of them. I will probably use the space to lengthen the blogroll and tinker around the edges. 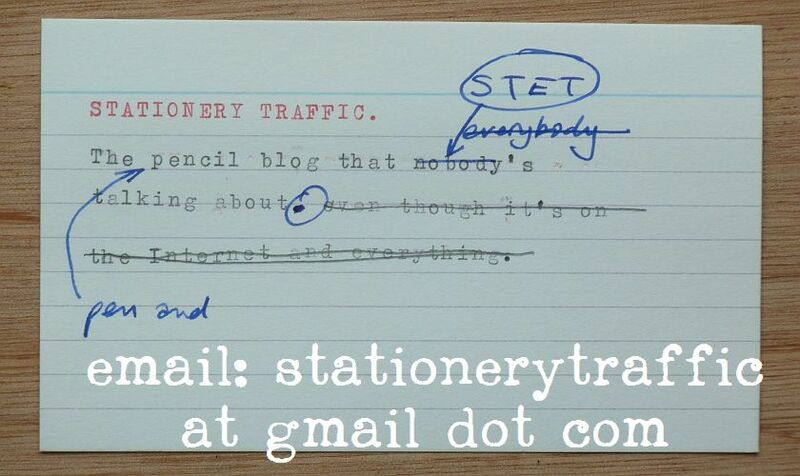 As always, the focus will be on blogging about my exploits in the world of stationery and "dead" media. *That is a rhetorical question, by the way. 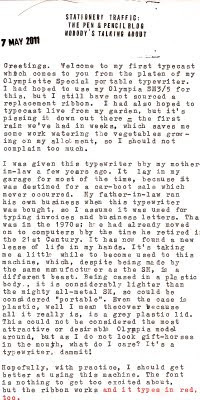 The other day I picked up a new typewriter which I had won in an auction on eBay. It's a Brother Deluxe 1350, which I bought for GBP4.99. The low price is due to it being sold as pick-up only, and as it wasn't far from my home, I thought it was worth a punt. I've had a quick turn on it, and taken a few photos which I do not have the time to upload just at the moment, and it's a lovely machine. 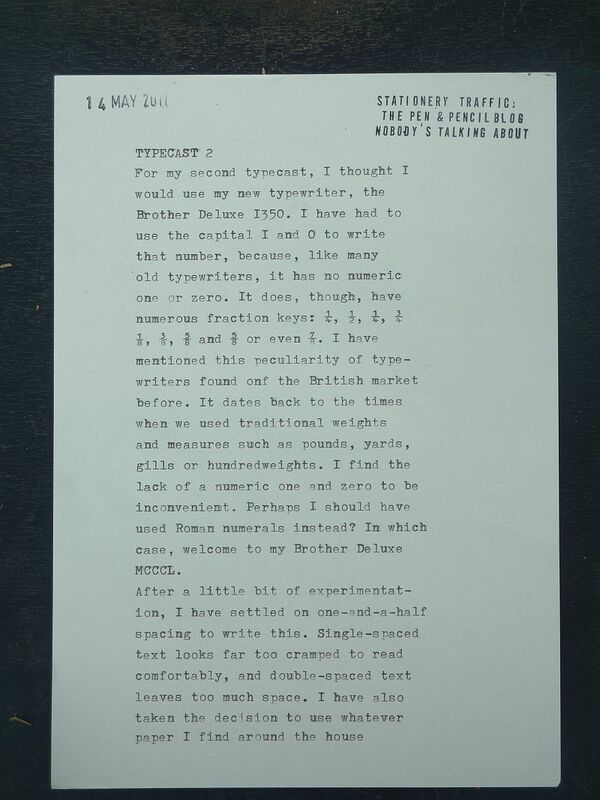 I'm delighted with it, especially when I see that a similar typewriter sold for GBP37. It seems to have a nice, smooth action, and although I have not mastered all the keys yet, I hope to shortly. I particularly like the fake wood panelling on the front, which reminds me of the fake wood on old American station-wagons (here in the UK we had real wood on our cars). 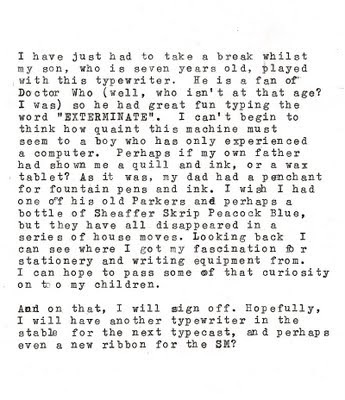 The font is a standard "Elite" typewriter font, but I'm no expert on these matters (I'm trying to find out more about different fonts). 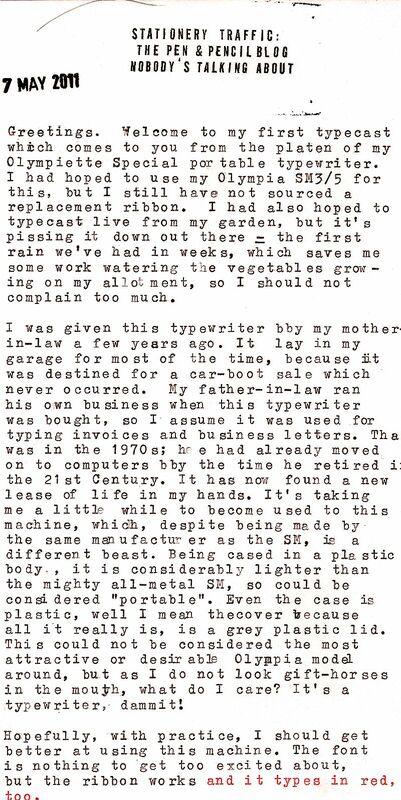 My wife is already concerned that I may get fixated on amassing a large collection of typewriters, but in fact I only want a few more (at least I tell myself this). 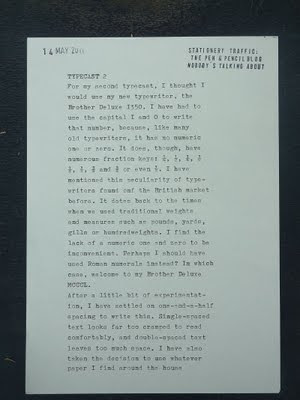 If I could get hold of a nice script-font model, an Olivetti Lettera 22/32 cheaply and one with a Techno Pica typeface, I'd be happy...for a while, at any rate. Another feature on this Brother is the fact that a previous owner, who I guess must have been a student, stuck a number of football stickers on the side. Apart from the team's sticker (Manchester United) there are stickers of a few players from the team which won everything in sight around the turn of this century: Ole Gunnar Sokskjaer, Ryan Giggs and Peter Schmeichel . I found this amusing, because Brother were the shirt sponsors for United's local rivals Manchester City in the 1990s. Back to stationery: on eBay, as in football, you win some and you lose some. I had bid on a printing set but I was unsuccessful this time around. I'll keep looking. No pictures this time, but today I used a pencil to mark a ballot paper at my local polling station. Today is an election day in much of the United Kingdom, with national government elections in Scotland, Wales and Northern Ireland, and local authority elections in England. I voted in none of those; instead I voted in a referendum held concurrently, the first referendum held across England since 1975. The referendum was to vote on whether or not to introduce a new voting system in Parliamentary elections. I won't go into the details of our electoral system but the choice was between retaining the current First Past the Post system and introducing an Alternative Vote system. Readers may be slightly surprised to see that the voting process in Britain is still very simple. I mark the ballot with a pencil according to my preference with an X in the box. And that's it. No machines are used in the count; we still employ teams of people to count the votes at town halls across the land. So there's your alternative use for a pencil: democracy. Not bad for a cheap HB stub on a bit of string....incidentally I voted for AV. Recently I've become interested in another weapon in the stationer's arsenal: the humble rubber stamp. 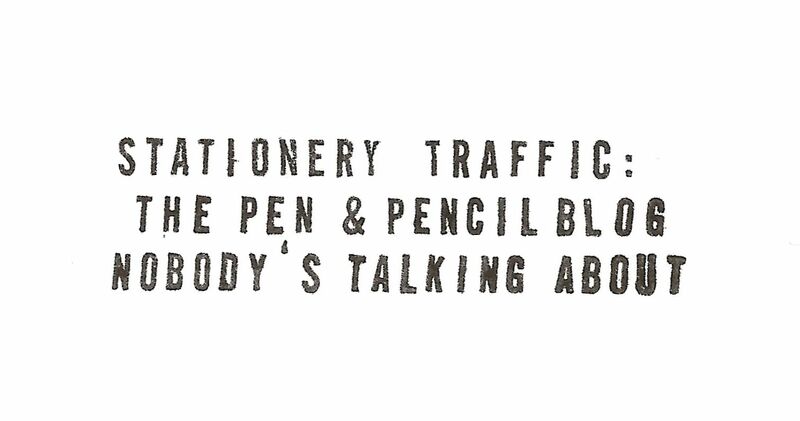 It started off a few years ago when I picked up a cheap self-inking rubber stamp kit from my local branch of Lidl. 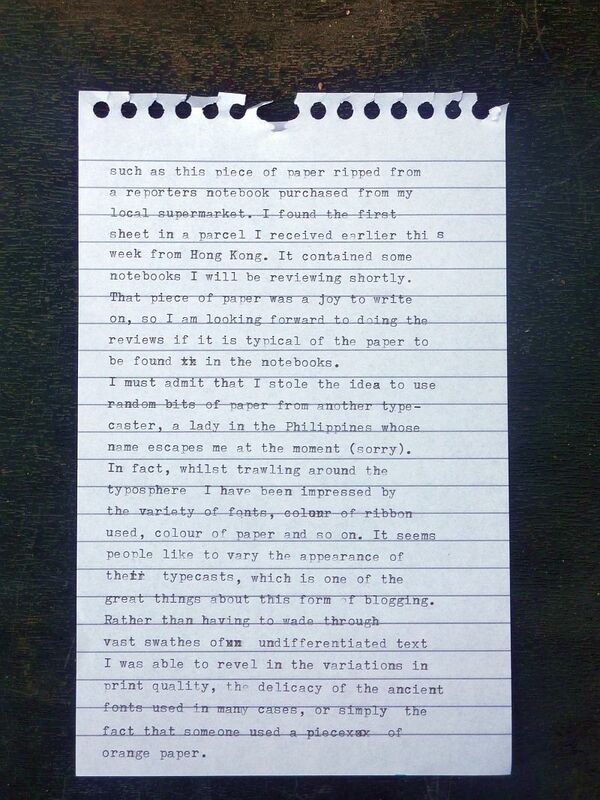 It is the sort which is a tabula rasa: a blank slate onto which you put your own message. Rather predictably I put my name, address and telephone number on it. I used it a few times, and then put it away in the desk and forgot about it until recently. 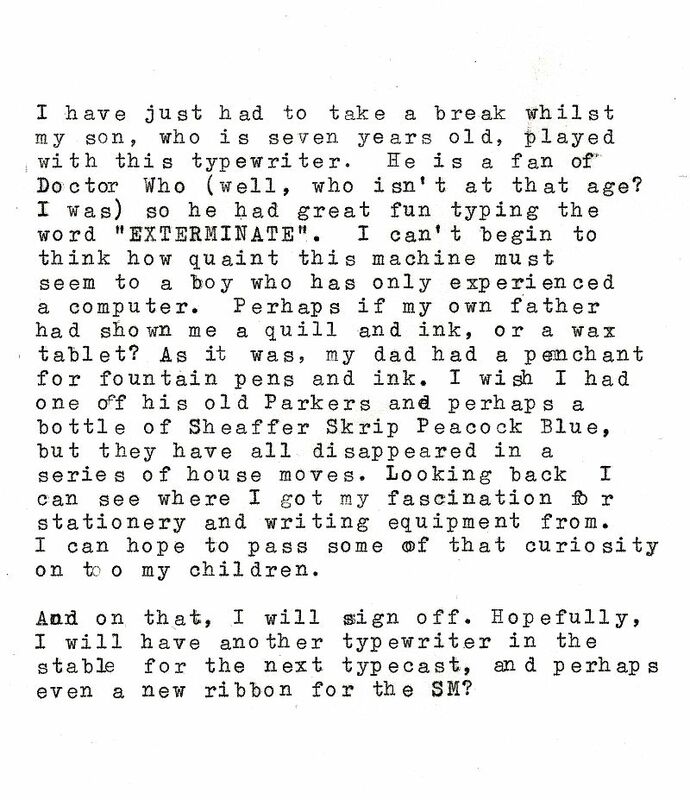 When I dusted it off the other week, the ink pad had dried out, and my efforts to re-ink it with a bottle from my local unnamed stationers were unsuccessful. I bought a Colop date stamp from the stationers, but I really wanted an address stamp, so eventually and after much procrastination I ordered one from customstampsonline.com. I used their online stamp designer, and had a traditional rubber stamp made up, the sort which requires a separate ink pad. It's very good indeed and I'm delighted with it. 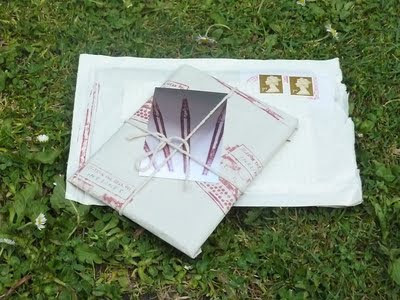 I've already used the new stamp on correspondence and for putting my name and address on various books in my library. I hope you don't mind, but I don't wish to show it here as, even though I don't hide my name on this blog, I don't want my home address plastered all over the internets. Needless to say if I send you a letter or card, you'll see it!